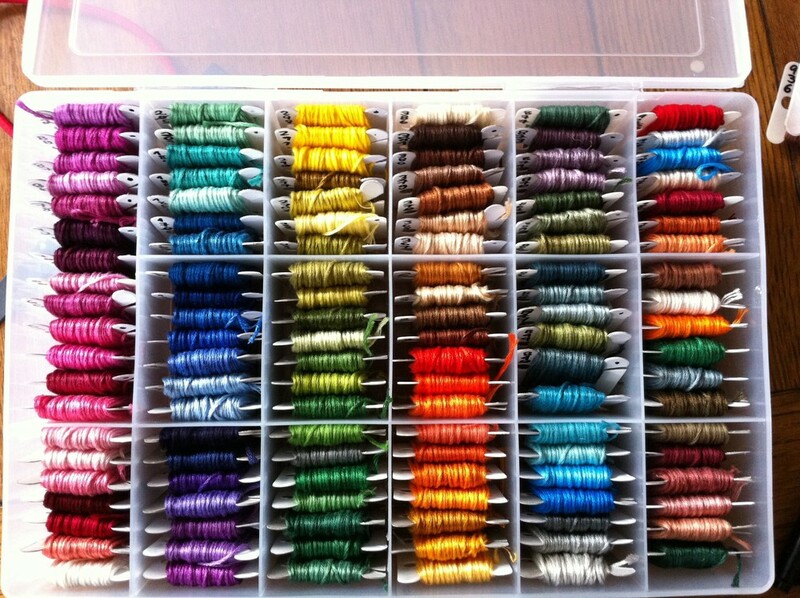 Well it's becoming obvious that for me, one of the attractions of embroidery is playing with coloured threads. Him Indoors said that it's like someone has given me one of the those boxes of 64 colours of crayons. He could be right, I do remember being deprived of crayons as a child, being locked in a cupboard all day with only a black crayon and a candle. But this is something really amazing because there are not just 64 colours, there are about 450! And that doesn't include all the speciality threads. Oh! Oh! Oh! What an instant addiction I have acquired. It's totally a gateway drug. You remember my previous post, where I bought a pack of 36 colours? Yes, well my next purchase was 100 colours. Then I moved onto the hard stuff -- the variegated colours. But that wasn't enough. I had to have the metallics. And then the designer drugs - the jewel effects, the antique effects, the pearlescents! the GLOW IN THE DARK threads. I was using so heavy now, I needed special boxes to put them in. 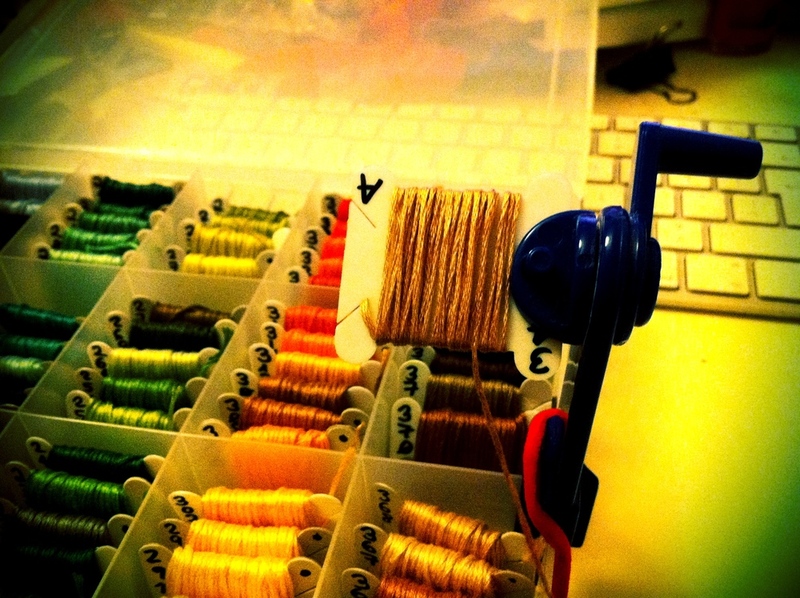 And bobbins! Oh, and a bobbin winder! Yes, it's like spoons and candles and rubber hoses around here folks. It's not just drug use, it's ritualistic drug use. It also feeds OCD impulses through the chronic desire to number the little bobbins (with the manufacturer's thread number of course!) and file them (oh but to file by number or to group by colour? choices choices!) and of course the hoarding... the terrible terrible hoarding. Saint Maximillian Mary Kolbe knows I love it. I won't even tell you how many threads I have acquired in the past few weeks. I am fighting with myself to stop now and to do more stitching (so I can use the threads up and buy me some more). Bless his little cotton socks, Him Indoors is even helping. He found me pouring over long lists of threads (okay, it was a spreadsheet that I had made to keep track of which colours I already have and which I need to order) and he said "oh baby, don't use a spreadsheet, you need a database for that". So he's writing me a database which will not only keep track of the threads I have but will give me the matching colours from various manufacturers. I think this means he's an enabler. I even like the little paper wrappers from the skeins of threads. Don't they look like cigar wrappers? No, don't worry. 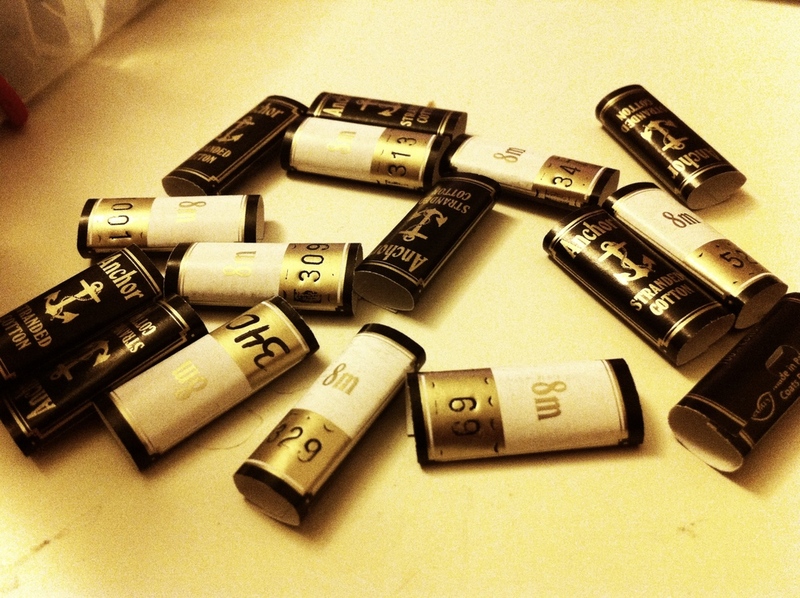 I don't save the wrappers.